Out ice fishing for the first time this season with son Cory up visiting. We went off of Fisherman's landing there were a half dozen trucks at the landing, going out with 4 wheelers, walking and us with a snowmobile. We fished a few hours late in the day and didn't venture too far out, there was a consistent 6" of ice in the approximate 1/2 mile area we drilled holes. I believe the conditions for the flowage as a whole are still hazardous I know it didn't freeze uniformly, I would assume there are a lot of areas still unsafe. A solid 6" inches of ice will support a tremendous amount of weight but a consistent sheet is key. That being said there are safe areas to fish but one can't just hop on a 4 wheeler or snowmobile and go anywhere. I am usually deer hunting until mid december and by the time I start ice fishing there is almost a foot of ice on the flowage. Haven't fished on thin ice in quite a few years, it was a little unnerving drilling the first hole it sure didn't look like 6 " but did confirm with a tape measure. 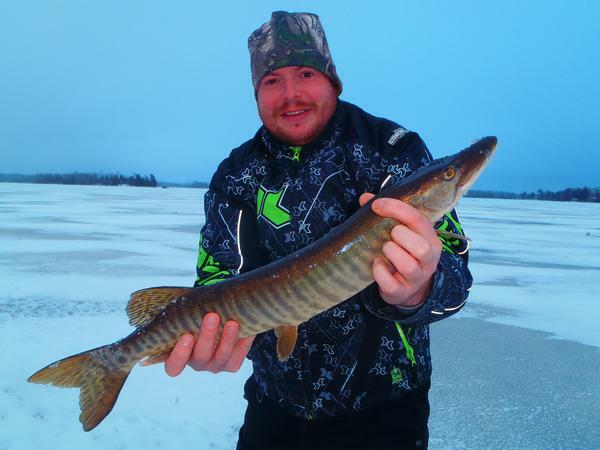 The fishing for us today was slow along with the other groups near us, had a few flags did catch a muskie. But it sure was nice to be out ice fishing. Planning on pulling the shanty out tomorrow with two snowmobiles, hence do have confidence in the ice in specific areas. Have fun , stay safe.